There’s no denying I’m a man who likes to can, fruit especially. This time of year I’m directing a parade of pots and pans on my gas range, keeping track of jellying points, scorching mishaps, rapid boils and slow simmers. For me canning fruit is truly a triumph of capturing summer in a jar. One spoonful of this seasonal goodness, and I’m sitting on the back stoop with Boz and Gracie on a sunny day, taking in a gentle breeze and a fine view. I have a scrapbook of new recipes to share, but I’ll start out with one that’s easy to make, and wonderfully decadent considering the sparse ingredient list: peaches, sugar, wine and cinnamon sticks. 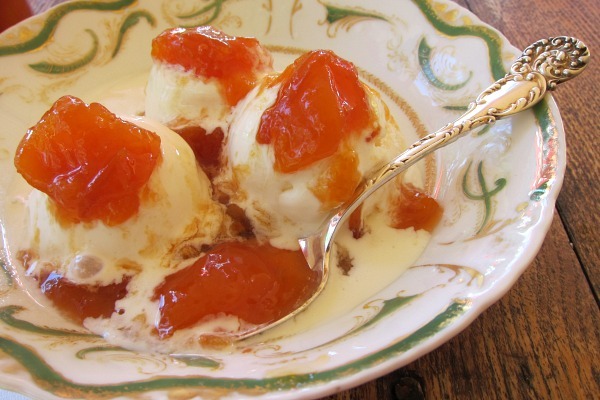 The result, a peach sauce that begs to be dolloped on anything from ice cream to biscuits to pancakes or a mouth wide open. Peaches also scream for ice cream. The following recipe I concocted one day after receiving a box of peaches from my pals at the Washington State Fruit Commission. 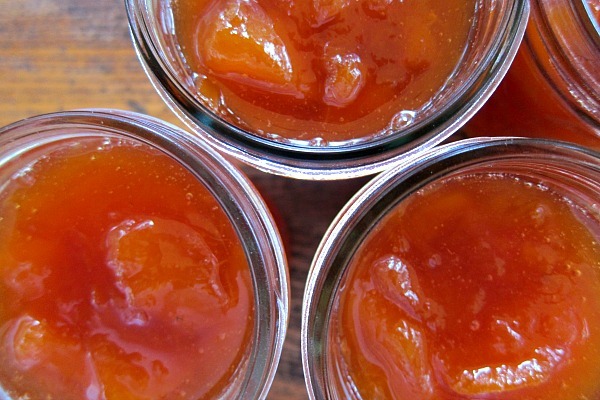 As one their Canbassadors (yep, I’m a diplomat for fruit), I was invited to enjoy the peaches and share some canning recipes that would showcase this stunning, juicy, delectable fruit. At you service, my friends, at your service. One of the best things I have ever eaten in my life was a dessert of fresh peaches with a glass of Sauternes. In this recipe, I pair peaches and wine again in a candied fruit sauce I reserve for special occasions. Summer peaches and a white wine on the sweet side make for a perfect pairing and a dreamy dessert sauce. 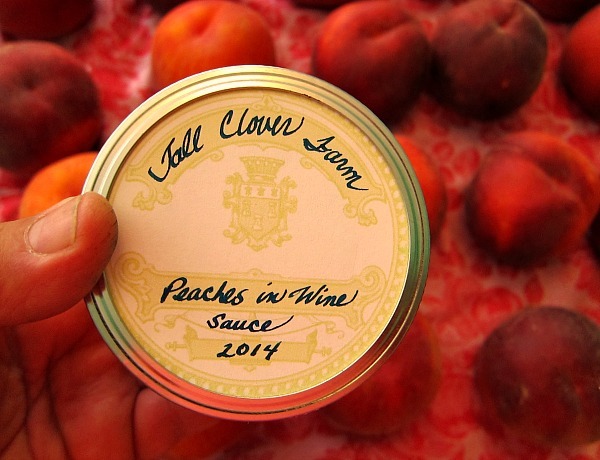 Each jar releases a summer day with each serving. Wash peaches. Don't bother peeling; skins dissolve. Remove pit. Slice in half. Cover peaches with sugar. Add lime juice. Cover and let sit out overnight. Add wine, and cinnamon sticks and begin to simmer mixture, stirring until sugar dissolves. After 5 minutes of low simmer and stirring, turn off heat. Let cool, and repeat Step 8, as many times as it takes to have peaches reach a translucent, candied appearance. Remove cinnamon, before canning. 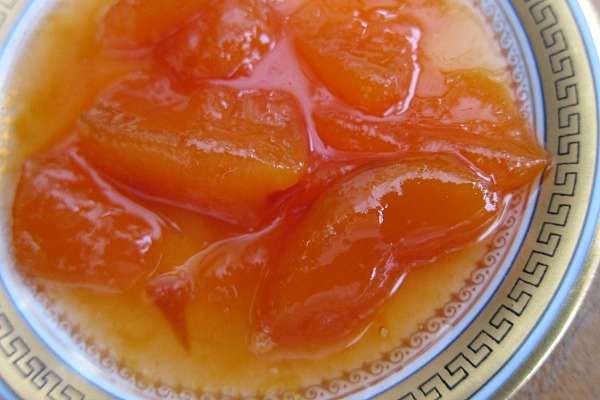 When peaches look candied, and the sauce has a syrupy quality, put sauce in jars, and seal using water bath. Or freeze if you prefer. Want to learn more about canning? Saving a little bit of summer, one jar at a time. Previous articleBack Door Eyesore: DIY Trellis to the Rescue! Perri, why thank you. My second and third grade teaches in South Carolina and Alabama, respectively, suffered no sloppy handwriting. Stern tutorials, and classroom humiliation make for better penmanship, apparently. Carol, I bet that would be wonderful with pears, though I would peel them as their peel can be bitter, and unrelenting in the texture department. I only wish we could grow muscadines here, unfortunately too rainy and cool for those fine southern grapes. This looks and sounds fabulous!!! Do you think it would works with apricots? Thinking about that Alsatian jam that I have made repeatedly. If we use just apricots, wine, sugar and a spice of some sort?? Wendy, that apricot jam recipe was the inspiration for this. Yes, absolutely it would work, maybe change out the cinnamon for a vanilla bean or two. I can’t remember the last time I had a ‘real’ peach – not those dry, grainy things they try to pass off as fruit in our part of the country. BUT if i find any, I will definitely try this recipe – looks fabulous. I want your life…. Thanks Isabel, and I do feel very fortunate, and hope to never take it for granted for one minute. The Washington State Fruit Commission picked the right person to be their “Canbassador”! Won’t it be wonderful pulling one of those jars from your pantry this winter? I’m jealous. Oh, this sounds excellent. I think I might try this one of these days using mead instead of grape wine. Laura, I’m almost embarrassed to say I’ve never had mead. Don’t tell my honeybees, they’ll be sorely disappointed in my lack of culinary sophistication. I will now seek it out. Thanks. Joumana, that’s a good issue to have, too many peaches! Mercy Tom….this sounds wickedly delicious! We get our peaches from the Oakanagan…if you ever get a chance to try fresh peaches from our interior (they even have a town call Peachland!) they are truly amazing. Ina, that sounds like my kind of road trip. I hear the Okanagan is one dreamy place, with orchards and vineyards and unlimited sun. Yep, one of these days I need to head up north and eat my way through the bounty of region. Thanks for the heads-up! 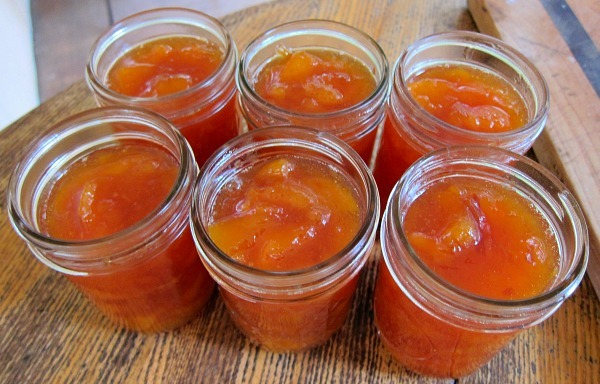 Thank you for this recipe and for the apricot jam recipe as well- a repeat gift for many of my friends. As an appreciation, I’d like to share this recipe with you- easy and good. I bought a half-bushel of gorgeous Red Haven Michigan peaches and made lots of candied peaches (I wrote you about this with great admiration last week) and still had plenty of peaches left, so I used the basic recipe for candied peaches, with two changes- I only used a cup of wine, and I changed the wine to sauvignon blanc because it is less sweet… I cooked it until it was jammy,using your method- cook it, turn it off, cook it again, canned it, and ooh la la! Three pounds of peaches made 6 8oz jars of magnificence, and I have you, once again, to thank for it! Thanks for this delicious sounding recipe. I’m trying it right now, but I’ve swapped out the cinnamon for star anise, because I’m obsessed with that magical spice. I have a question – how long are you processing your jars for in the canner? I’m thinking it should be as for canned peaches, 10 mins for half-pints and 20 for pints? I’ve not processed anything with wine before. Exciting! Hi Amanda, because of the amount of sugar and the wine, I’d say you’d be fine with just 10 minutes, or 15, that’s usually what I do. And I’ll have to try the recipe with star anise, which sounds like a great option to kick it up a bit. Cheers, canning comrade!